When Winter knocks, the lovely and talented Mrs. Zheng3 glides from the fading garden to her full-spectrum basement arboretum, where she prunes and pots and plots and plans for Spring's return. No bonsai enthusiast's toolkit is complete without an assortment of knives, clippers, wires, and weights. 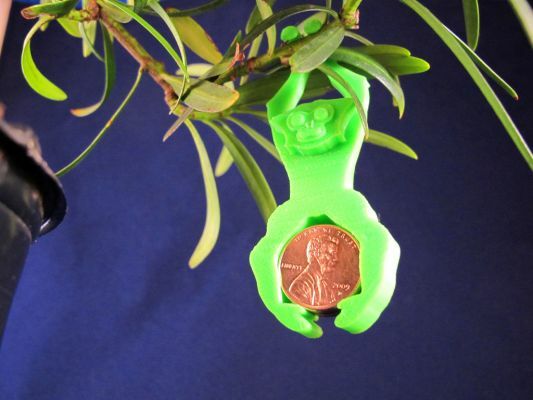 The Bonsai Gibbon carries up to five snap-fit U.S. pennies and provides gentle downward pressure for slowly bending a branch. With a little scaling he could easily hold a peppermint for tressing your tannenbaum.